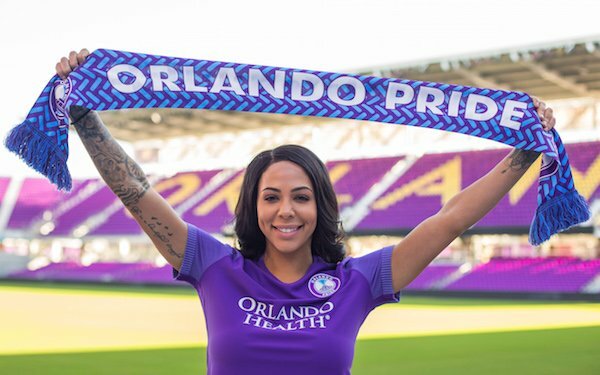 Sydney Leroux will be reunited with her husband Dom Dwyer for a second time after being traded by the Utah Royals, for whom she never played a game, to the Orlando Pride. Photo courtesy of Orlando Pride. Dwyer was traded from Sporting KC to Orlando City last summer. Utah will receive a first-round pick in the 2019 NWSL College Draft for Leroux. The pick was acquired by Orlando from Seattle on Tuesday. “We’re very happy we were able to bring Sydney to Orlando,” Pride GM Niki Budalic said. “She’s a dynamic striker that will bring pace and goal-scoring ability to our group. Her physicality and personality will complement our roster and club and look forward to having her with us." Leroux, 27, was a member of the FC Kansas City in 2016 and 2017 and her rights transferred to Utah following FC Kansas City's demise. She missed the 2016 season as she was pregnant with her first child. Leroux played for the Boston Breakers, Seattle Reign and Western New York Flash before moving to FC Kansas City in January 2016. In 2015, she asked Seattle to be traded to Kansas City to be with Dwyer but the Reign turned around and traded her to the Flash. In 2013, Leroux scored a league-leading 11 goals and earned a spot on the NWSL Best XI. In 2014, she helped the Reign win the NWSL Shield.